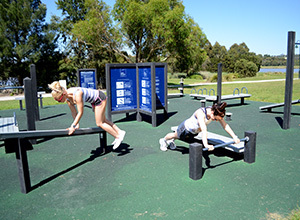 The Exersite™ is a cluster of 15 self-guided, recycled plastic exercise stations. 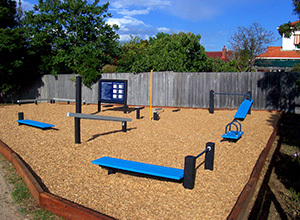 Grouped in a defined area of 12 m x 12 m, the system allows users to systematically work out in a safe and effective manner. The Exersite™ can be modified to allow for safe wheelchair usage by adding some pieces and modifying others. 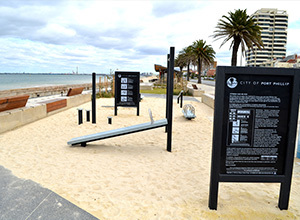 Signs show exercises for able bodied users with corresponding exercises for wheelchair users.